Spa Recipes for Birthday Parties and Sleepovers - great for kids, tweens and teens. 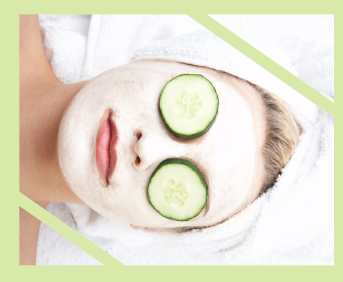 Make your own homemade spa treatments from these recipes including masks, facials, foot spa's and bath salts. These homemade spa recipes are perfect for our Spa Birthday Theme and	Chocolate Spa Birthday Theme. 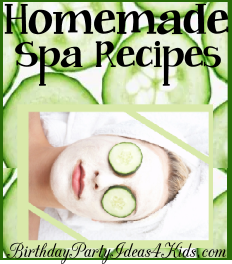 These homemade spa recipes are easy to make and most use items you have either around the house or in the refrigerator. Mix together sugar, baby oil, honey, strawberry extract and vanilla until well blended. Add a few drops of pink or red food coloring and mix. Place Pink Sugar Scrub in a jar with a lid. Good for 1 week of use. Combine ingredients and mix well. Apply to clean face and neck. Leave on for 20 to 30 min. Rinse with plenty of warm water. Excellent moisturizer that leaves skin baby soft. Mix all ingredients together using a small blender. Relax for 10 minutes then rinse off with warm water. small pots and let set. toilet paper roll (or consider using an empty deodorant container). Place tube, in the bowl, in the freezer overnight. To use, peel away just the top 1/4 inch of the cardboard roll and smooth the frozen stick over your face	(think of it as a push up pop). Leave your mask on for 5 to 10 minutes, then rinse off with warm water. Return the cream stick covered with plastic wrap and frozen between uses. Facial mask made from peaches and egg whites that helps tighten your skin. Whip peach and egg white together in a blender until smooth. Gently pat mixture over face. Leave on for 30 minutes. Rinse off with cool water. fridge before	use to make it especially soothing. Mix together the yeast and oats in a small bowl and set aside. Peel the cucumber and place it in a small food processor and process until only liquid remains. Add the yogurt and honey and process further to mix. mixture and process to mix fully. To use, apply to clean face and neck skin and leave on for anywhere from 15 minutes to a half hour. Rinse well	and follow with toner and moisturizer. Homemade Spa recipe for a creamy facial mask that leaves your skin soft and refreshed. Mix all the ingredients and apply to clean face and neck. After 15 minutes rinse with plenty of cool water. Puree the cucumber and parsley finely and mix with the yogurt until smooth. Cover your face with the mask. The mask will rejuvenate your skin as it moistens it. Leave mask on for 15 minutes for best results. Mixture can not be stored - make fresh each time. Finely grind oatmeal in a food processor or blender. In a small bowl mix together honey and yogurt. Mix together until a smooth paste has formed. Smooth over face and neck. facial is great with this), place one cucumber slice over each eye. Gentle homemade hand scrub recipe that leaves your hands nourished and soft. Add the oatmeal to 1/4 cup water and let stand 10 minutes until oatmeal is softened. oil to oatmeal and mix well. Rub mixture into your hands and let stand 1-2 minutes. melt in microwave. Stir with spoon. a few minutes, then add essential oil. – one each of three different colors. orange Kool-aid, Lavender Oil for Grape Kool-aid, etc. Mix one envelope of Kool-aid to 1 quart salts in three separate bowls. Add 3-4 drops of essential oils to each of the three bowls, in a scent which To use, add 1/2 to 1 cup salts per bath. This recipe makes a pore cleaning strip which works just like those sold in drugstores. Mix the two ingredients and microwave for 10 seconds until it is warm. Using a clean cosmetic brush apply to nose and chin area. Rinse of the cosmetic brush immediately. Allow mixture to dry on nose and chin for 10 - 15 minutes. The mix will dry and be quite stiff and form a film. to be in your nose pores will appear.